A cyclist rides west on JFK Boulevard in Center City Philadelphia, Nov. 2, 2016. Philadelphia is the ninth-most dangerous US city for bicyclists, a study found earlier this month. The report comes amid growing calls for safer biking conditions in the city after two cyclists were recently struck weeks apart while riding along unprotected bike lines. Released by 24/7 Wall St., the study weighed bike-related deaths in 32 major cities against their respective populations, total traffic fatalities and an estimated percentage of people who use bikes for their work commute. The site came up with a cyclist fatality rate per 1 million people, which it then used to order the cities from most dangerous to safest for cyclists. In Philly, National Highway Traffic Safety Administration data shows seven of the 93 traffic-related fatalities in 2015 were cyclists, putting the city's bicyclist fatality rate that year at 4.5 per 1 million people. 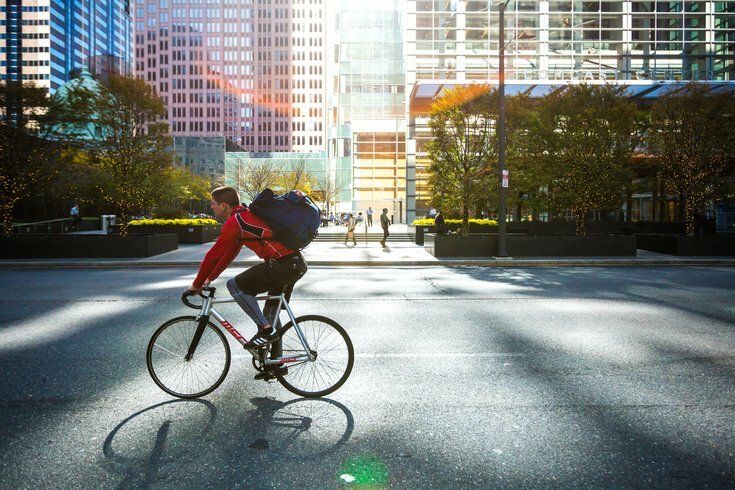 Citing a 2016 US Census Bureau survey, the site also stated that 2.2 percent of the city's working-age population is thought to commute to work by bike. About 70 percent of the 818 bicycle-related deaths nationwide in 2015 happened in urban areas, according to the NHTSA. Last month, 24-year-old Emily Fredricks was fatally struck by a garbage truck while riding along an unprotected bike lane on Spruce Street in Center City, marking the city's fourth biking fatality this year. City officials then repainted the bike lane where Fredricks was struck several days after the incident, work that activists had long called for. Last Friday, Becca Refford, also 24, was hit by a delivery truck while riding in a bike lane on 13th Street in Center City. She is recovering in the hospital and awaits a second surgery. Activists staged protests after both incidents, forming human walls along the bike paths in which the two women were hit and calling for more protected bike lanes throughout the city. Philadelphia officials announced last week a protected bike lane spanning seven blocks near the South Street Bridge over the Schuylkill River will be installed by mid-2018. Flexible delineator posts are set to line the South Street bike lane from 21st to 27th streets, as well as along one block of 27th Street, between South and Lombard streets. Those bike lanes will also be repainted. The project had been planned for months, and a community listening session on the work drew about 200 people in July. Mayor Jim Kenney has pledged to install more than 30 miles of protected bike lanes by 2022. The city offers about 200 miles of bike lanes, 2.5 of which are physically protected.